Our Rockefeller University life science marketing event is approaching on March 27th, 2014 and is the perfect life science marketing opportunity for lab suppliers selling lab equipment in New York. When you purchase by December 27th, 2013, you are eligible for early registration pricing. Early registration for our life science marketing events is the best value way of getting the word out on your lab products and life science solutions. Rockefeller University has a wealth of research funding available, making New York one of the best funded markets for lab suppliers selling lab equipment. According to recent NIH and NSF research funding statistics, the university was awarded $70.9 million in 2012. The NIH awarded Rockefeller University $70.1 million in 2012, while the NSF also awarded Rockefeller University research funding totaling $844,385 in 2012. For more funding information on Rockefeller University, including a list of departments receiving NIH funding organized by department name, number of awards received and total funding awarded, please read our blog $70.9M in Research Funding at Rockefeller University. By registering early for our Rockefeller University life science marketing event, you will be guaranteed a table even if the trade show sells out. This is a well-attended event, and lab suppliers in the area won’t want to miss out on this life science marketing opportunity. 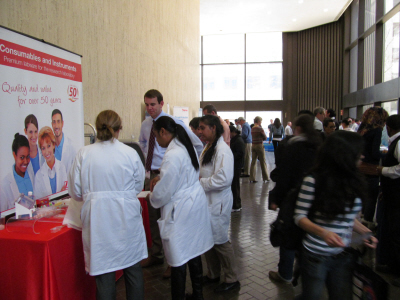 Last year, our Rockefeller BioResearch Product Faire™ Event was visited by 398 attendees. Of those who came, 102 were purchasing agents, professors, and post docs, and 22 were lab managers. The attendees came from 28 different research buildings and 77 departments around campus. Biotechnology Calendar, Inc. events draw large crowds of attendees because researchers love learning about new products on the market, our appetizing catered lunches, talking with others researchers and sales reps about their work and the door prizes we give away. If you are interested in being an event sponsor and giving out event bags and lanyards at our Rockefeller University life science marketing event, we encourage you to read our article Increase Laboratory Product Sales with Event Sponsorships. Sponsors who give out prizes often draw the large crowds because researchers are excited to receive prizes and talk with the sales reps giving them out. Biotechnology Calendar, Inc. invites all lab suppliers interested in life science marketing opportunities and selling lab equipment to network with researchers, purchasing agents and lab managers at our Rockefeller BioResearch Product Faire™ Event on March 27th, 2014. Don’t forget to register early by December 27th, 2013 to receive the best value package for this life science marketing opportunity and to be guaranteed a table at the event. Biotechnology Calendar, Inc. is a full-service science research marketing and events-planning company that has organized on-campus life science marketing events at top research universities nationwide for over 20 years. If you would like to learn more about life science marketing opportunities and selling lab equipment at other research institutions across the country, we encourage you to view our 2014 calendar of events. For more information on our Rockefeller BioResearch Product Faire™ Event, or to view more funding statistics for Rockefeller University, click on the button below.